Looking for unusual wedding entertainment ideas for your wedding reception or any other special occasion? Then why not book a comedy stage hypnotist or a mind reading show? Hypnosis is really funny! and mind reading is humorous with the emphasis on audience participation. It will make your wedding function truly memorable! 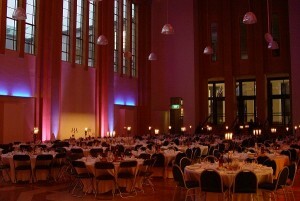 It is a great focal point and cabaret for the after wedding party! 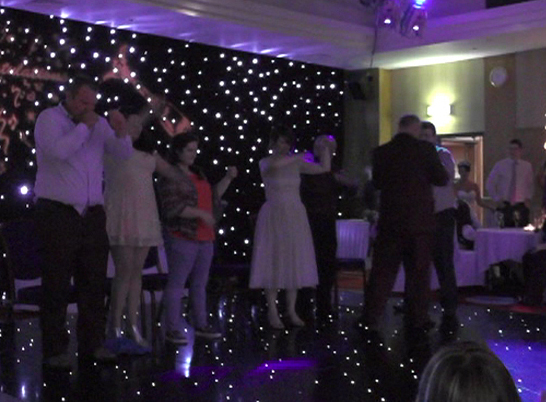 It is suitable wedding entertainment for all ages and will not offend anyone! It will leave everyone talking about your wedding reception for months and months and for all the right reasons! Your wedding is one of the most memorable days of your life and your guests are there to enjoy it with you and take away some special memories. How important is good wedding entertainment? An interesting ‘post wedding’ survey result has recently been published by Bride & Groom magazine. * Almost 100% of all brides said they would have spent more of their budget on the entertainment. * 81% of guests say the thing they remember the most about a wedding is the entertainment. Most couples think of music for their entertainment, a DJ and maybe a live band or musician but very few think beyond that. A Comedy Hypnosis show or a Mentalism show can be used as an alternative way to ensure your guests are entertained it is a unique way of breaking the ice between friends and new family members who may have never met before. Make your special day special! This truly is your special day, you want it to be memorable and stress free, that is why it is so important to book professional, flexible, cabaret. You need someone who is experienced and who will get on with things and use his own initiative if necessary. 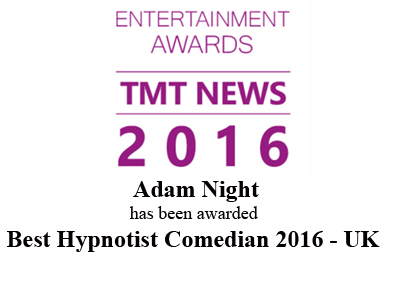 Adam Night has been a full time professional stage hypnotist for over twenty five years and performed at many wedding receptions big and small. You can trust that he knows just how to make your big day memorable for all the RIGHT reasons. What ever the season, the comedy hypnosis show works well, whether you are looking for spring wedding ideas summer wedding ideas, autumn wedding ideas, winter or Christmas wedding ideas this comedy event is always a talking point. It is important not to leave the booking of your wedding entertainers until the last minute, if you want the quality you deserve, remember so too do other people. Adam nights’ show is sold on a first come first served basis. Why not give Adam Night a ring to discuss your ideas, (he has probably done more weddings than you) he will be more than happy to offer advice, he may even have worked at your venue before and know all about it and what works best! What about something different on your Hen night or Stag night? A comedy hypnosis show works really well on most medium to large party nights that have a dedicated room they can use for at least part of the night. Adam Nights’ show is sensitive to many cultural differences and he is adept at performing at all types of occasions including Gay Weddings, Jewish Weddings, Asian Weddings, and Gypsy Weddings.